Are you looking to get a real estate license, but don’t know what the requirements are, what the costs are, or how difficult it will be to pass the test? If you are one of those people, you have found the right web site. This site will give you everything you need to help you to become a real estate agent. I will also provide you with some start up tips and tricks to getting your real estate business off the ground. So if you are new to the real estate game, and need a real estate license to get going, I would recommend that you watch the video below and I’ll walk you through, step-by-step, the entire process of getting your real estate license quickly and easily. shared with any third party. I own investment property myself, manage property for others, do fix up and rental projects, and sell property as one of the cornerstones of my business. So take it from me, you can become a real estate agent, and you can make it in this dog-eat-dog world. 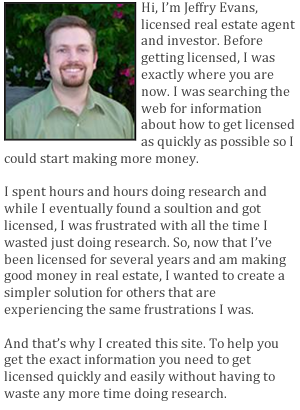 If you take the advice of Real Estate License .org, and apply it, you too can be successful in real estate. So take a look around the site, and good luck!